The Sony DPS-D7 is a digital delay unit equipped entirely with Sony’s digital and audio technology at its highest level of sophistication which was released before with the Digital Reverberator, DRE-2000 and MU-R201 and has received much praise. The Sony DPS-D7 converts the incoming analog signal to a digital signal, passes it through various effects, then re-converts it to an analog signal before output. The determinant to the sound quality is the conversion mechanism that adopts the 18-bit oversampling stereo Al D converter and the pulse D/A converter of 49,152 MHz. These account for highly accurate. less deteriorated effects. The large size backlit LCD of 40 characters by 2 lines makes it possible to proceed with smooth operation while viewing the operating condition in real time. Moreover, the LCD display incorporates an on-line manual (in English) which displays information required for operation. The unit has a hundred variations of the effects created by musicians, sound mixers and acoustic engineers around the world in its preset memory. This will help you select and replay immediately the desired effects for a particular purpose. The EDIT function allows you to modify the presets or to create some individual effects. Besides the preset memory for a hundred effects, the unit has a so-called user memory where you can save up to 256 effects you are going to create. Using this memory allows more varicolored play of effects. The Sony DPS-D7 is equipped with 7 types of algorithms in the Delay block; Stereo delay, Feedback delay. Double delay, Tap delay. Long tap delay, Panpot tap delay and Multi-delay. In addition, it is provided with the Equalizer block and the Auto panner block. By using these blocks and algorithms, the DPS-D7 can create the wide range of effects which no other existing delay unit can achieve. 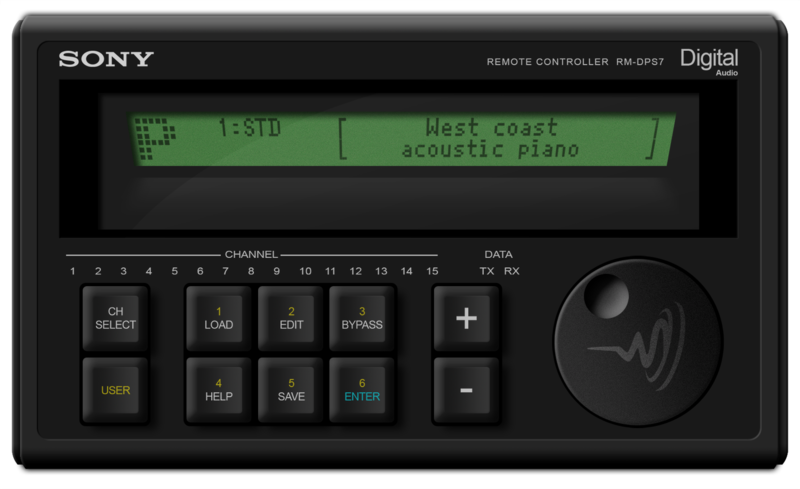 The remote commander (not supplied) makes it possible to remotely control the unit. The Sony DPS-D7 has XLR connectors (balanced-type) and phone jacks so that it can be connected to instruments, recording equipment or PA (public address) equipment. The MIDI device incorporated in the Sony DPS-D7 can receive program change signals from another MIDI equipment connected so that the Sony DPS-D7 can be controlled by the MIDI equipment connected. Thus it can function as an effector when connected to digital instruments. In addition, controls from PCs or MIDI sequencers are very helpful for composition.